1. The objective of this Standard is to prescribe the minimum content of an interim financial report and to prescribe the principles for recognition and measurement in preparing and presenting financial statements for an interim period. Timely and reliable interim financial reporting improves the abilities of investors, creditors, and other users to understand an enterprise’s capacity to generate earnings, cash flows and its financial condition and liquidity. 2. This Standard applies if an enterprise is required to publish an interrim financial report in accoradance with law and regulations. The Standard also applies if an enterprise elects to publish an interim financial report. Enterprises should publish interim financial reports in accordance with law and regulations. Interim period: is a financial reporting period shorter than a full financial year. Interim financial report: is a financial report containing either a complete set of financial statements as described in VAS 21 “Presentation of financial statements” or a set of condensed financial statements as described in this Standard for an interim period. 5. This Standard defines the minimum content of an interim financial report as including condensed financial statements and selected explanatory notes. The interim financial report is intended to provide an update on the latest complete set of annual financial statements. Therefore, it focuses on events, new activities and does not duplicate the information previously reported. 6. This Standard encourages the enterprise to publish a complete set of financial statements in its interim financial report. This Standard encourages an enterprise to include in a condensed interim financial statement more than the minimum line items or selected explanatory notes as set out in this Standard. The recognition and measurement principles in this Standard apply also to the complete financial statements for an interim period, and such statements would include all of those disclosures required by this Standard (particularly the selected note disclosure in paragraph 13) as well as those required by other Standards. 8. If an enterprise publishes a complete set of financial statements in its interim financial report, the form and content of those statements should conform to the requirements of VAS 21 “Presentation of financial statements”. 9. If an enterprise publishes a set of condensed financial statements in its interim financial report, those statements should include, at a minimum, each of the heading and subtotals that were included in its most recent annual financial statements and the selected explanatory notes as required by this Standard. Additional line items or notes should be included if their omission would make the condensed interim financial statements misleading. 10. Basic and diluted earnings per share should be presented on the face of an income statement, complete or condensed, for an interim period. 11. A parent company publishes the consolidated financial statements in accordance with VAS 25 “Consolidated financial statement and accounting for investment to subsidiaries” should prepare the condensed consolidated financial report for in interim period together with its separate interim financial report. 12. A user of an enterprise’s interim financial report will also have access to the most recent annual financial report of that enterprise. It is unnecessary, therefore, for the notes to an interim financial report to provide relatively insignificant updates to the information that was already reported in the notes to the most recent annual report. At an interim date, an explanation of events and transactions that are significant to the understanding of changes in financial position and performance of the enterprise since the last annual reporting date is more useful. (j) the changes in the contingent liabilities and contingent assets since the last annual balance sheet date. 14. Other accounting standard specifies disclosure that should be made in financial statements. In that context, financial statements means complete sets of financial statements of the type normally included in an annual financial report and sometimes included in other reports. The disclosures required by those other Standards are not required if an enterprise’s interim financial report includes only condensed financial reports and selected explanatory notes rather than a full set of financial statements. 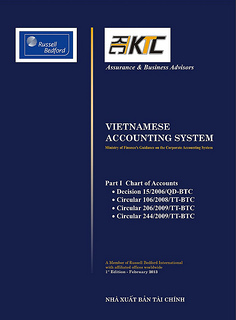 Disclosure of compliance with Vietnamese Accounting Standards and System. 15. If an enterprise’s interim financial report is in compliance with this standard, that fact should be disclosed. An interim financial report should not be described as complying the Vietnamese Accounting Standards unless it complies with the Vietnamese accounting standard and the guideline on implementation of Vietnamese accounting standard of Ministry of Finance. (c) cash flow statement cumulatively for the current financial year to date, with a comparative statement for the comparable year-to-date period of the immediately preceding financial year. 17. For an enterprise whose business is highly seasonal, financial information for the twelve months ending on the interim reporting date and comparative information for the prior twelve-month period may be useful. 18. In deciding how to recognise, measure, classify, or disclose an item for interim financial reporting purposes, materiality should be assessed in relation to the interim period financial data. In making assessments of materiality, it should be recognised that interim measurements may rely on estimates to a greater extent than measurements of annual financial data. 19. VAS 01 “Framework” defines “An intem is material if its omission or misstatement could significantly misstate the financial statements influencing the economic decision of users of the financial statements”. VAS 29 “Changes in accounting policies, accounting estimate and the fundamental errors” requires disclosure changes in accounting estimates, fundamental errors, and changes in accounting policies. VAS 29 does not privide quantitative guidance as to materiality. 20. While judgement is always required in assessing materiality for financial statements preparation purposes, this Standard bases the recognition and disclosure decision on data for the interim period by itself for reasons of understandability of the interim figures. Thus, for example, unusual or extraordinary items, changes in accounting policies or estimates, and fundamental errors are recognised and disclosed on the basis of materiality in relation to interim period data to avoid misleading inferences that might result from non-disclosure. The overriding goal is to ensure that an interim financial report includes all information that is relevant to understanding an enterprise’s financial position and performance during the interim period. 21. If an estimate of an amount reported in an interim period is changed significantly during the final interim period of the financial year but a separate financial report is not published for that final interim period, the nature and amount of that change in estimate should be disclosed in a note to the annual financial statements for that financial year. 22. VAS 29 “Changes in accounting policies, estimates and fundamental errors” requires disclosure of the nature and (if practicable) the amount of a change in accounting estimate that either has a material effect in the current period or is expected to have material effect in subsequent periods. The paragraph 13 d) of this Standard requires similar disclosure in an interim financial report. Examples, include changes in the estimate in the final interim period relating to inventory write down, restructurings that were reported in an earlier interim period of the financial year. The disclosure required in the preceding paragraph is consistent with VAS 29 “Changes in accounting policies, estimates, and fundamental errors” to narrow in scope-relating only to the changes in estimate. 23. An enterprise should apply the same accounting policies in its interim financial statements as are applied in its annual financial statements, except for accounting policy changes made after the date of the most recent annual financial statements that are to be reflected in the next annual financial statements. However, the annual and interim reports of enterprise should not affect the measurement of its annual results. To achieve that objective, measurements for interim reporting purposes should be made on a year-to-date basis. 24. Requiring that an enterprise apply the same accounting policies in its interim financial statements as in its annual statements may seem to suggest that interim period measurements are made as if each interim period stands alone as an independent reporting period. However, by providing that the frequency of an enterprise’s reporting should not affect the measurement of its annual results. Year-to-date measurements may involve changes in estimates of amounts reported in prior interim periods of the current financial year. But the principles for recognising assets, liabilities, income, and expenses for interim periods are the same as in annual financial statements. 26. Under VAS 01 “Framework”, the financial statements should reflect factos relating to the enterprise’s financial position and performance, and such factors should be reported item by item. The definitions of assets, liabilities, revenue, and other income and expenses are fundamental to recognition, both at annual and interim financial reporting dates. 27. For assets, the same tests of future economic benefits apply at interim dates and at the end of an enterprise’s financial year. Costs that, by their nature, would not qualify as assets at financial year end would not qualify at interim dates either. Similarly, a liability at an interim reporting date must represent an existing obligation at that date, just as it must at an annual reporting date. 29. In measuring the assets, liabilities, income, expenses, and cash flows reported in its financial statements, an enterprise that reports only annually is able to take into account information that becomes available throughout the financial year. Its measurements are, in effect, on a yearto-date basis. 30. An enterprise that reports for interim period uses information available at that preiod in making the measurements in its financial statements for the period and information available by year-end or shortly thereafter for the twelve-month period. The twelvemonth measurements will reflect possible changes in estimates of amounts reported for the period. The amounts reported in the interim financial report for the first six-month period are not retrospectively adjusted. Paragraphs 13(d) and 21 require, however, that the nature and amount of any significant changes in estimates be disclosed. 31. An enterprise that reports for the period measures income and expenses on a year-to-date basis for each interim period using information available when each set of financial statements is being prepared. Amounts of revenue, other income and expenses reported in the current interim period will reflect any changes in estimates of amounts reported in prior interim periods of the financial year. The amounts reported in prior interim periods are not retrospectively adjusted. Paragraphs 13(d) and 21 require, however, that the nature and amount of any significant changes in estimates be disclosed. 32. Revenues that are received seasonally, cyclically, or occasionally within a financial year should not be anticipated or deferred as of an interim date if anticipation or deferral would not be appropriate at the end of the enterprise’s financial year. 33. Examples include dividend, seasional revenue, royalties, and government grants. Additionally, some enterprises consistently earn more revenues in certain interim periods of a financial year than in other interim periods, for example, seasonal revenues of retailers. Such revenues are recognised when they occur. 34. Costs that are incurred unevenly during an enterprise’s financial year should be anticipated or deferred for interim reporting purposes if, and only if, it is also appropriate to anticipate or defer that type of cost at the end of the financial year. 35. The measurement procedures to be followed in an interim financial report should be designed to ensure that the resulting information is reliable and that all material financial information that is relevant to enterprise is appropriately disclosed. While measurements in both annual and interim financial reports are often based on reasonable estimates, the preparation of interim financial reports generally will require a greater use of estimation methods than annual financial reports. (b) when it is impracticable to determine the effect ofapplying a new accounting policy to prior periods, adjusting the financial statements of prior interim periods of the current financial year, and comparable interim periods of prior financial years to apply the new accounting policy prospectively from the earliest date practicable. 37. One objective of the paragraph 36 is to ensure that a single accounting policy is applied to a particular class of transactions throughout an entire financial year. Under VAS 29 “Changes in accounting policies, estimates, and fundamental errors”, a change in accounting policy is reflected by retrospective application, with restatement of prior period financial data, if practicable. However, if the amount of the adjustment relating to prior financial years is not reasonably determinable, then under VAS 29 “Changes in accounting policies, estimates, and fundamental errors” the new policy is applied prospectively. An allowed alternative is to include the entire cumulative retrospective adjustment in the determination of net profit or loss for the period in which the accounting policy is changed. The effect of the principle in paragraph 36 is to require that within the current financial year any change in accounting policy be applied retrospectively to the beginning of the financial year. 38. To allow accounting changes to be reflected as of an interim date within the financial year leading to two differing accounting policies to be applied to a particular class of transactions within a single financial year would be interim allocation difficulties, obscured operating results, and complicated analysis and understandability of interim period information.